Circuit size and energy requirements both reduced by approximately 85%, marking a big step forward toward performance boosting of ultrafast transmissions at 100 Gbps and beyond. Tokyo and Kawasaki, Japan, and Beijing, China, September 26, 2011 — Fujitsu Limited, Fujitsu Laboratories Limited and Fujitsu Research and Development Center Co., Ltd. of China jointly announced their development of a digital signal processing algorithm to compensate for waveform distortions in signals transmitted by fiber-optic cables in long-haul transmission systems of 100 km or more. Compared to conventional technology in widespread use in literatures, the size and power requirements of the new circuit are reduced by approximately 85%, and are reduced by approximately 50% compared to circuits previously developed by Fujitsu. Some of this research was conducted as part of the "Universal Link Project R&D" sponsored by National Institute of Information and Communications Technology (NICT)(1), Japan. Details of this technology are being presented at the 37th European Conference and Exhibition on Optical Communication (ECOC2011), opening September 18 in Geneva. As the volume of data transmitted over the internet grows with the widespread use of smartphones and the development of cloud services, the trunk-line networks operated by telecom carriers and the networks that tie together large-scale datacenters are being called upon to carry more bandwidth at lower cost and greater efficiency. Wavelength division multiplexed (WDM) fiber-optic transmission systems that can carry 100 Gbps per wavelength—more than ten times existing levels—are expected to go into volume commercial deployment around 2012, and R&D efforts are progressing to enable continuous capacity increases in the future. 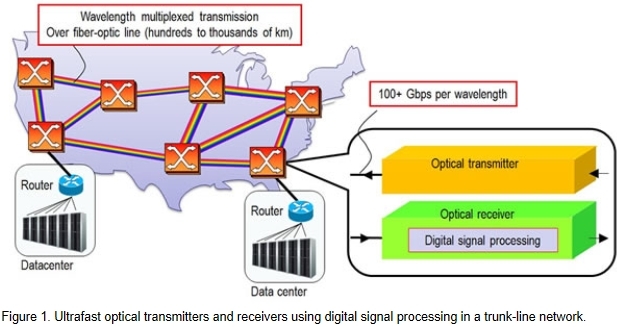 When transferred over long distances of hundreds of kilometers by fiber-optic lines, ultrafast signals carrying data at speeds of 100 Gbps or more suffer from waveform distortion caused by nonlinear optical effects(2), making it difficult for the signal to be correctly received. This has prompted research into nonlinear compensation technology(5), which can restore the signal received with distortion to a clean waveform. Using conventional methods, however, the implementation of nonlinear compensation technology would require massive circuits with more than 100 million logic gates, and chips that include such compensation circuits are only expected to become feasible around 2020. Reducing the scale required of such circuits, therefore, has been a pressing issue. 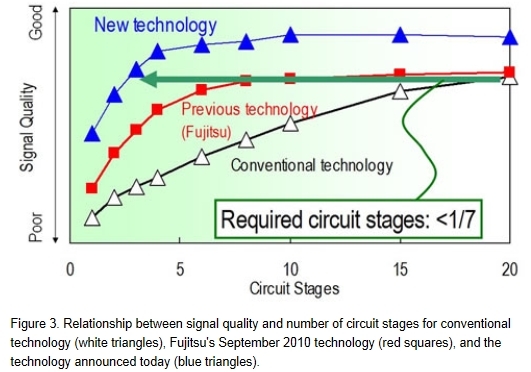 The Fujitsu team has now developed a new signal-processing algorithm that, while retaining the distortion-correction performance of the technology developed last year, slashes the number of stages(3) required in a distortion-compensation processing circuit to about one-seventh current typical levels (and about half the level of Fujitsu's previous technology). Key features of this technology are as follows. 1. Improved mathematical modeling for more accurate distortion compensation As a result of approximation analysis, in which signal distortions are expressed as mathematical models, Fujitsu has been able to formulate distortion components that previous technologies have overlooked. 2. Development of an efficient distortion-compensation circuit Additional refinements to the above numerical modeling made it possible to develop an efficient design for accurate compensation, implemented in a small circuit. 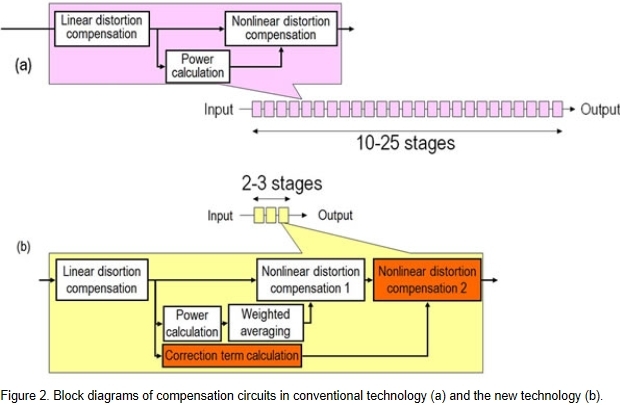 Adding this compensation circuit to the technology that Fujitsu developed in September last year resulted in a dramatic leap forward in the accuracy of distortion compensation and greatly reduced the number of circuit stages and overall size. 1. National Institute of Information and Communications Technology: NICT was established in April 2004 as an incorporated administrative agency to carry out research and development in the field of information and communications technology. The agency is based in Tokyo and led by Dr. Hideo Miyahara, president. 4. Circuit stages:In nonlinear compensation technology, because the linear distortion and nonlinear distortion tend to gradually compensate for each other over long-distance transmission lines, the same circuit must be designed so that it has multiple stages of serial connections.